The Heart Sutra is the most most famous teaching in Mahayana Buddhism, encapsulating the essence of the teachings. It is estimated to have been composed between the 2nd and 4th centuries CE. When Bodhisattva Avalokitesvara practices the profound Prajna-paramita, he intuitively realizes that the five aggregates (skandhas) are of Sunyata (Void) nature thus securing his deliverance from all distress and sufferings. Sariputra! Form does not differ from Sunyata, nor Sunyata from form. Form is identical with Sunyata (and) Sunyata is identical with form. So also are reception, conception, mental conduct and consciousness in relation to Sunyata. Sariputra, the Sunyata nature of all things is neither created nor annihilated; neither impure nor pure; and neither increasing nor decreasing. there are no such things as the twelve links in the chain of existence from ignorance with also the end of ignorance up to old age and death with also the end of old age and death; there are no (such things as) the four noble truths and there is neither Wisdom nor obtainment. Because of no obtainment, Bodhisattvas who rely on Prajna-paramita (The Heart Sutra), have no hindrance in their minds, and since they have no hindrance, they have no fear, are free from perversive and delusive ideas and attain the Ultimate Nirvana. 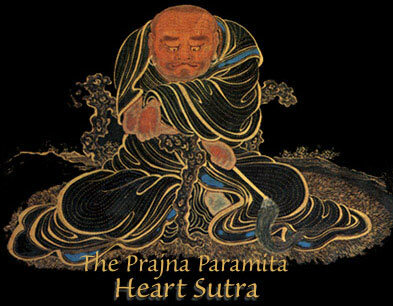 All Buddhas of the past, present and future attain the Full Enlightenment by relying on Prajna-paramita. So we know that Prajna-paramita is the great supernatural Mantra, the great bright, unsurpassed and unequalled Mantra which can truly and without fail wipe out all sufferings. 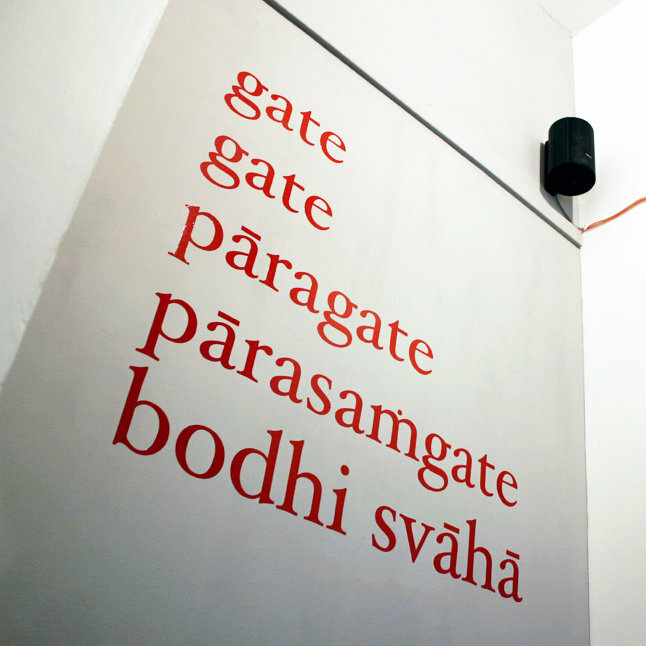 Gate, Gate, Paragate, Parasamgate Bodhi Svaha! OSHO speaking on the Heart Sutra……. ”De Chardin calls it ‘the omega point’, Buddha calls it nirvana, Jainas call it moksha, Christ calls it ‘God the Father’. These are different names. This whole sutra is concerned with the movement from the third to the fourth, from the noosphere to the christosphere, from intellect to intelligence, from self-consciousness to no self-consciousness. The third is like waking, ordinary waking, and the fourth is what Patanjali calls turiya, ‘the fourth’. He has not given it any name, and that seems to be very beautiful. Call it ‘christosphere’, and it looks Christian; call it ‘Krishnasphere’, and it looks Hindu; call it Buddhasphere, and it looks Buddhist. Patanjali is very, very pure; he simply calls it ‘the fourth’. That contains everything. He has not given it a particular name. For three he gives names because they have forms, and wherever form is, name is relevant. The formless cannot have any name – turiya, ‘the fourth’. This whole Prajnaparamita Sutra is about the movement from the third to the fourth. Sariputra is at the peak of the third: the noosphere – reflection, thinking, self-consciousness. He has traveled to the uttermost into the third, he has reached the maximum of it. There is no more to it. He’s standing on the boundary line. GONE, GONE, GONE BEYOND, GONE ALTOGETHER BEYOND. O, WHAT AN AWAKENING, ALL HAIL! Buddha uses ‘gone’ four times. These are the four things that he uses ‘gone’ for: the geosphere, the biosphere, the noosphere, the christosphere. ‘Gone’ – gone from matter, gone from the body, gone from the visible, the tangible. He again uses ‘gone’ a second time – gone from life, the so-called wheel of life and death. ‘Gone beyond’, the third time he uses ‘gone’ – now gone beyond mind, thought, thinking, self, ego. ‘Gone altogether beyond’ – now he uses it a fourth time… even gone beyond the beyond, the christosphere. Now he has entered into the uncreated. Life has moved a full circle. This is the omega point, and this is the alpha too. This is the symbol you must have seen in many books, in many temples, in old monasteries – the symbol of the snake holding its own tail in its mouth. You have come back home. Perfection of Wisdom, saw clearly that the five aspects of human existence are empty*, and so released himself from suffering. Gone, gone, gone over, gone fully over. Awakened! So be it! Haha, or maybe a tattoo? I remember hearing once that the first teaching given in the west was one word, ‘Relax’. The students then asked, ‘How do we do that?’ And so it goes. What I love about his sutra is that it totally messes with your head. Rather than giving us something to work on, it takes every damn thing away until there’s nothing left. Thanks for posting.